Corsair’s no stranger to PC building. Apart from having a wide range of components under its belt, from cases to power supplies, it’s also had a go with the Bulldog kit PC. It was an odd first choice for the company, and a product that seemed to be a solution in search of a problem. 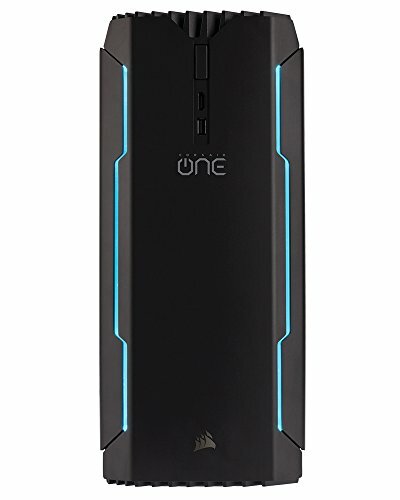 The same cannot be said for the Corsair One (of which the Pro is the top model), a complete PC solution that is not only powerful, but extremely well-engineered. There are two things you first notice about the One (which is impossible to type without thinking of The Matrix). The first is that it looks amazing. Its enclosure measures only 12 litres in volume, so it’s surprisingly small for what it packs inside, and the matteblack aluminium panels and green lighting from the trim gaps between those panels make for a system that looks both elegant and powerful. And since it’s so small, it’s also very versatile, at home on or under a desk, or in your loungeroom, for some PC-powered gaming. If you’ve got a 4K television, and want to expand your gaming setup, the One will not look out of place next to your giant flatscreen. And given the front HDMI slot, it’s also ready for convenient VR setup out of the box. When you turn it on, though, it’s also amazingly quiet. This is impressive for a case this size, where you might expect tiny hamster-cage fans whizzing away to keep everything from overheating. The shape of the One allows natural convection to do a lot of the heavy lifting when it comes to cooling, assisted by a fan mounted in the top of the chassis, beneath a grilled and vaned heatsink. Solid cooling is important, too, as the One Pro is packed with performance parts. Under the hood is an Intel Core i7 7700K backed by 16GB of DDR4 RAM, and an overclocked MSI GTX 1080. Power is courtesy of a custom-made SFX 80-plus Gold PSU, complete with a passively-cooled zero-fan mode. The PSU has been tuned for this particular case interior. The slim design aesthetic extends to the software side of things, with Corsair delivering very little in the way of bloatware. There’s Corsair’s handy Link utility and a few game installers, which makes perfect sense given the One’s gaming focus. Aside from the operating system, there’s very little other clutter on the Corsair-made 1TB SSD that serves as the system’s main storage. Not only did the One handle 3DMark’s Firestrike test with aplomb, it did so extremely quietly, able to top out the more intense tests at around 90-100 frames per second, and scoring 8845 overall. In PCMark 8 tests, the One was just as spritely, hitting an impressive 4799, which places it well above the minimum score for not only a solid VR experience, but also a 4K gaming one. And, all the while, the case remained barely audible, and that only in our enclosed, very quiet test-lab. In a realworld environment, with a game or music running, and the sounds of your average house, it’s practically silent. While we worry about walled gardens, this is a nonetheless beautifully engineered gaming system that is as powerful as it is attractive.